Plan a trip to Napa Valley, California and enjoy experiences beyond basic wine tastings. There’s so much more that Napa has to offer – like great food, stunning views and olive oil tastings! Visiting Napa Valley and Calistoga in February is a great time to go. First of all, it’s the off season for the tourist traffic. You’ll be able to make your tasting reservation and get a seat at Gott’s Roadside and be able to get in and out of Dean and Deluca’s. 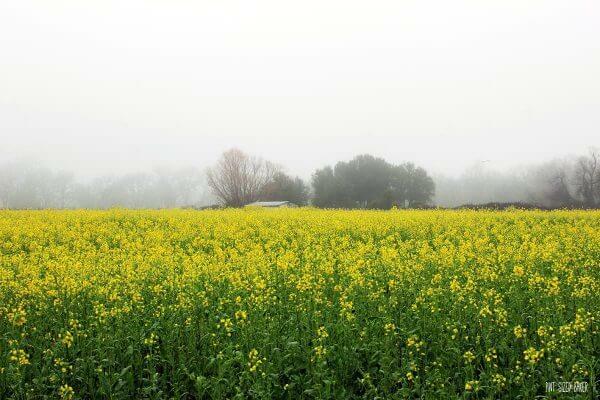 The mustard plants are in bloom and the fields are full of beautiful yellow flowers as far as the eye can see. The weather is a mix of sunny days and rainy days, so pack accordingly. I would love to visit Napa and Calistoga during harvest time and actually see fruit on the vines, but I don’t know if I’ll be able to handle the crowds, however, that’s for next time (fingers crossed). 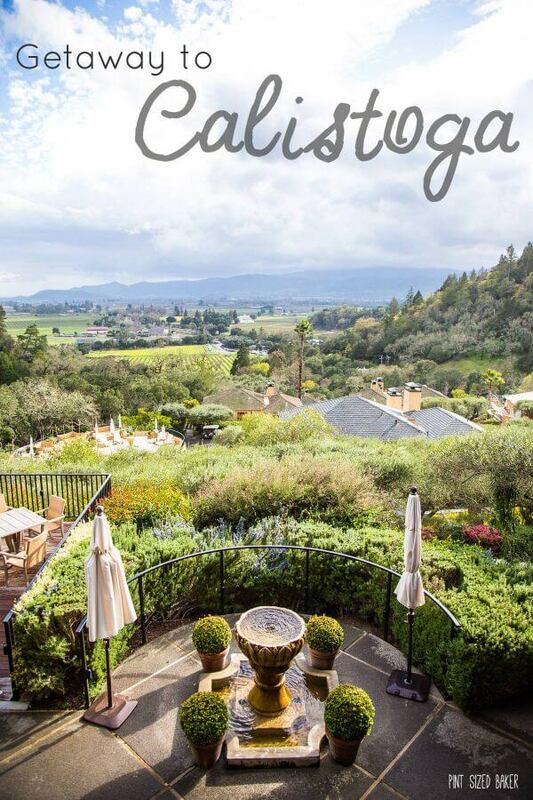 One can not simply stay in Calistoga the entire time. Napa Valley is long and there are so many other places to go to and experience. 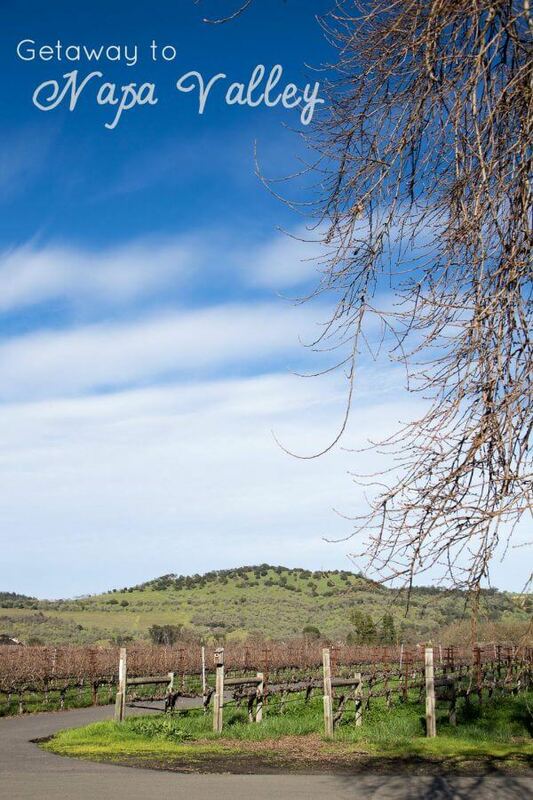 There are some wonderful wineries that do more than just let you taste wine. Plan a trip to Napa Valley and let your senses run wild! It’s a Sweet Destination! Get on over to the road less traveled – the Silverado Trail. There you will find the Rutherford region and the Auberge de Soleil. This world class hotel and spa is located in a side valley and has some of the best views around! It was a little cold and rainy the day we visited, but the sun cleared enough for us to get outside and snap a few shots! The Auberge hosts many weddings and I can see why. They also offer fine dining, and spa services. I wish it had been nice enough to check out the pool, but I’ll have to save that for next time. Besides, I was too busy enjoying my complementary house sparkling wine, hand tossed pizza, and a slice of their famous Hazelnut Daquoise that Sarah was nice enough to arrange for us. OMG! Talk about an amazing dessert! I’ve wanted to make a daquoise for quite sometime, but never had the gumption to make it. You can bet i’m going to try it now. It’s just a basic dessert cake made with layers of almond and hazelnut meringue and whipped cream or buttercream. Easy peazy, right? I hope so, because I’m going to make one. If you would want to try this dessert, feel free to order a Auberge Torte au Chocolat for overnight delivery. My husband said he wanted one for his next birthday – I don’t think I can last that long. Peju has started to more interactive events and one of the new events is a wine tasting with food pairings in the Peju executive kitchen with chef Alex. Erik and I were invited to the kitchen to check out one of these events. I thought it was a great way to try some wine and not have your taste buds go numb after your 4th or 5th tasting. After all that eating drinking, it was time for a tour of the grounds and barrel rooms. Chef Alex has some raised beds with fresh veggies growing and their vineyard is in their back yard – literally. The family still lives on the property in a house tucked behind some trees. The barrel rooms are impressive and the tasting rooms are gorgeous! 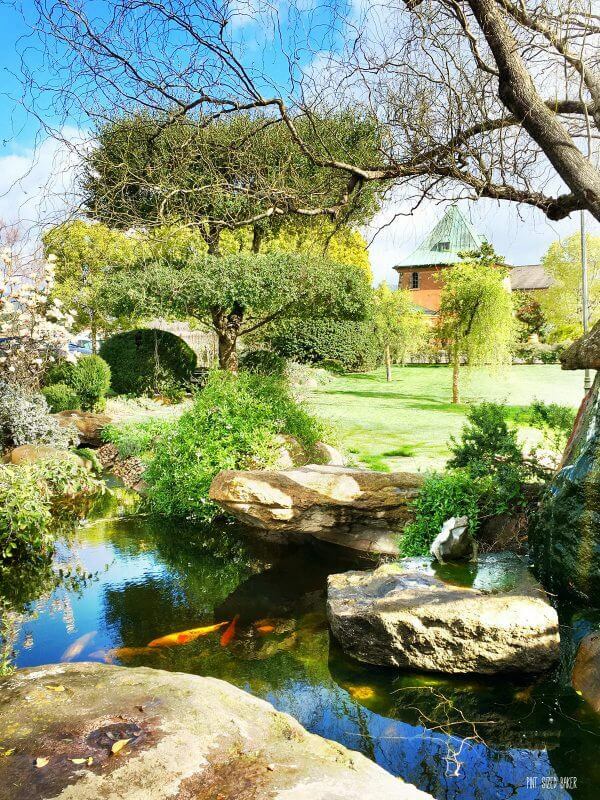 Take a tour and see all the behind the scene stuff or just take a glass of wine out to the statue garden and relax by the koi pond. The grounds are beautiful! If you love wine, then you’ve got to get on over to Mumm Napa for some Sparkling Wine! Made in the Champagne Method, a tasting there is a MUST! First of all, the grounds are beautiful, but it’s the bubbly that I love. Erik and I enjoyed a complementary DVX tasting and we loved every sip. My brother had a tasting as well. I don’t know what he said or did, but when I looked over at them, there were about 15 glasses on the table. He was having a great tasting, that’s for sure! We ended up joining the club and I’m looking forward to our first shipment! You can take a guided tour of the bottling facility and ask a million questions about sparking wine.You can also relax on the patio or take in the photo gallery with images from Ansel Adams. Looking for something different to experience? The Round Pond Estate is the perfect destination! No only do they have the vineyard, they also specialize in Olive Oil, Vinegar, and Simple Syrups. They have olive trees on site and they harvest the green olives and press them right there in their facility. They offer a pure EVOO as well as flavored orange and lemon olive oil. These flavored oils are a great way to add some extra flavor to your dishes. We’ve added the lemon olive oil to our asparagus and they were so good! If you’ve ever tried good olive oil you know that it is amazing. We learned a lot about how to know if your EVOO is still good or if it has expired and I learned how vinegar is made (it’s a secret). The vinegar is made from the same grapes that they use to make the wine. I made quite an attractive face when I tried the vinegar right out of the bottle, but when it was mixed into a vinaigrette and served with a salad, it was so good! Sweet and tart, but not over powering. Loved it! Finally, came the sweet ending. When Round Pond make the blood orange olive oil and the Meyer lemon olive oil they had a lot of fruit left over, so they decided to make simple syrups with them. They sell Blood Orange Citrus Syrup, Meyer Lemon Syrup, and Pomegranate Syrup. They are perfect as an ice cream topper or mixed into a 7-up, but they were amazing when served with the yummy desserts – lemon shortbread cookie, orange chocolate truffles, and a no-bake cheesecake were the perfect ending to the day! There is just so much more to Napa Valley than hitting all the popular wineries for a tasting. Take the time for a special experience that delights all of the senses. Taste, yes obviously, but take the time to hear, smell, listen and touch all of the wonders that Napa has to offer. Thank you to all the businesses that provided me with discounted or complementary services, however, all opinions and experiences were my own. Read more about Calistoga and all the sweet things I did there. Or, if you’re on the east cost, a trip to West Virginia is in order. 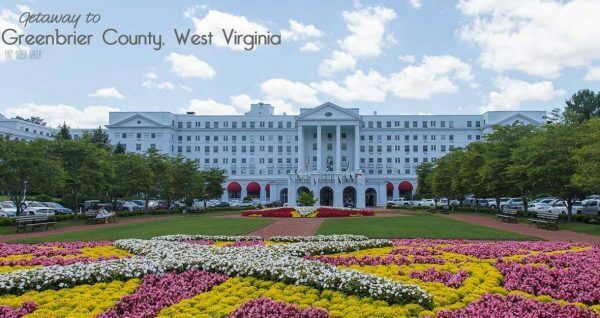 Get away to Greenbrier County, WV and get back to Mother Nature. One day. This is definitely a place that’s on my bucket list. Beautiful post, Karyn. It’s pretty AWESOME!! Move it up on the priority list 🙂 You won’t be disappointed. Just try to go during the off season. I heard the crowds can be brutal in the summer and around harvest. Love Love Love Napa Valley!! Peju has been a long time favorite….they have a great wine club!! All wine lovers should join their club!! What a beautiful place. I have never been to Napa, it looks like a fun getaway. The cake looks amazing. Can’t wait to see your version. Thanks for linking up to Tips and Tricks. Hope to see you again this week.